Our friends over at Tractor Ted have launched a brand new range featuring big machines! The new Digger Designs range has been created to complement some of the books and DVDs which already feature heavy machinery - Tractor Ted Big Machines and More Big Machines - in addition to the classic farm machinery featured across the Tractor Ted range. The Digger Designs range has launched with two products - a thermal lunch bag and a rucksack - in classic blue with designs featuring Tractor Ted and a range of heavy construction machinery, with the slogan 'Tractor Ted gets to work with a little help from his friends' the two new items will be the perfect back to school purchase for any Tractor Ted, or construction fan. The rucksack and thermal lunch bag featuring Digger Designs will launch on 1st July and be available at www.tractorted.co.uk, priced at £8:99 for the thermal lunch bag and £12 for the rucksack. 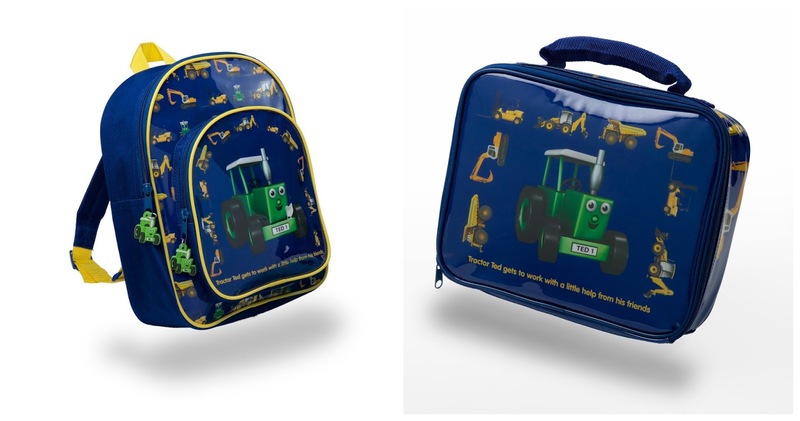 I've teamed up with Tractor Ted to offer a thermal lunch bag and a rucksack. One winner will receive the lunch bag, another will receive the rucksack. Please enter using the Gleam widget below, ensuring you read the terms and conditions. The blog post comment is compulsory and will unlock a range of additional entries.